The third largest felid, Jaguar is an incredible animal. The most active and vigorous of the big cats, it is designed for tremendous strength and agility. It is a versatile cat and perhaps the most 'complete' predator in family felidae. A resident only of the Americas, the reclusive Jaguar holds a high place in local folklore and big cat analyses owing to his prolific predation. Despite the outside resemblance with the leopard, the Jaguar is more muscular and compact - with weight ranging from 275-350 lbs for the males, the females being roughly 15% lighter. Length ranges between 1.61-1.85 metres. Significant size variations are however observed in the species depending on the habitat of the animal, with the smallest Jaguar recorded at 80 lbs! Panthera Onca, the Jaguar is the only New World Mammal amongst the four big cats of the Panthera genus. Ancestry is shared with the other big cats, with the closest genetic resemblance being to the leopard. Chromosomal analysis suggests the species originated somewhere between 300,000 to 500,000 years ago. Three subspecies are generally recognized based on geographic distribution - the Peruan, Mexican and Paraguan Jaguar. Coloration is usually yellowish, with variations towards red and black. The coat is covered by rosettes having a pattern unique to each individual. Stark color variations do exist, with some Jaguars being totally black or white. The former are often incorrectly referred to as 'black panthers'. Appearance varies also on the habitat of the animal. Usually denizens of the dense forests have darker coats to aid them in conditions of low lighting, whereas Jaguars of relatively open plains have a lighter coloration to assist in their camouflage. These animals are also considerably bigger than their jungle counterparts since they have to tackle larger prey animals. With powerful limbs, rounded skull and a robust physique, the Jaguar is a study in strength. Pound for pound it is one of the strongest land mammals. Its jaw strength goes unrivaled amongst all big cats. The great strength in canines and jaw bones has in fact enabled the Jaguar to practice a mode of killing most frightful among all predators of land - whilst capable of the usual neck bite and strangulation technique of big cats - the Jaguar prefers to kill its prey by a bite through its skull! The devastating bite is delivered between the ears of the prey as its teeth pierce the skull to enter the brain. The caiman is hunted in this manner as is the tortoise whose shell is cracked with ease by the great cat. 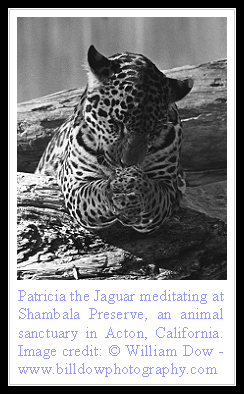 At times the Jaguar may prefer to crush the cervical vertebrae or simply kill by a tremendous blow from its paw. At stalking, Jaguar has no peer. Designed for stealth and a powerful pounce, Jaguar is considered as the best ambush hunter in all of animal kingdom. Its remarkably silent approach towards prey is simply incredible to watch. The other outstanding feature is its terrific hunting prowess in water. With a prey base from baby alligators to fish, Jaguar's aquatic hunting abilities are the best among land predators. Yet another remarkable weapon in the Jaguar's arsenal is the superb climbing ability of the heavily muscled cat - that enables it to prey on surprised monkeys and birds and carry prey as big as cattle to tree tops to avoid rising flood levels, using its great strength. Territorial and solitary animals, adults meet solely for courtship. Mating continues year round and after a gestational period of three and a half to four months, two to four cubs are born. The females are highly protective of the defenseless young and roar frequently to warn other animals away. Maturity is reached at two years of age, by which time Jaguars are able to hunt on their own and establish their territory. Lifespan is the longest among big cats with ranges of up to 15 years in the wild and 25 years in captivity. 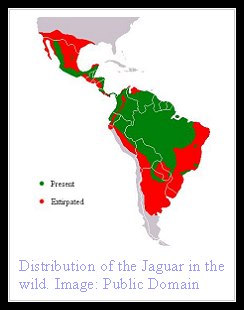 The range of the Jaguar in the wild is declining owing to deforestation. Numbers are also decreasing due to escalating conflicts with poachers and ranchers. However the species is not threatened yet and there is encouraging news for the future with flourishing of the ecotourism industry and strict conservation policies gaining ground in parts of the Americas, ensuring future hope for the magnificent apex predator of the Amazon! I live in Peru at the moment (originally from the U.S.), and I am (well I WAS until my camera got stolen at gunpoint a couple months ago) an amateur photographer. Well, I was talking to a friend (a native Peruvian) about going to the town of Manu to get photos of, among other things, jaguars. Well, during that conversation, he told me a story about a friend who lives in Manu. The story is that jaguars have some inherent instinct that tells them they are near a pregnant woman, and that they will protect her. The Manu guy's wife was pregnant a few years ago, and one night,shortly after she first got pregnant, she went out in the middle of the night to go to the bathroom (an outhouse). She heard some heavy breathing, first from her left, then a few seconds later from her right, then behind her. Well, these people are used to that kind of thing, so she continued to the outhouse. On her way back to the house, she heard the same thing - breathing from what felt like a triangle of something in the dark. Well, when she told her husband about her experience, he knew exactly what that was. It was three jaguars outdside the house, forming a perimeter around her to make sure nothing would be able to approach her. Fascinating that an animal like that would have such an instinct; and well, why a wild animal would want to protect a human is beyond me, but I guess it happens. I've heard similar experiences involving dolphins. Anyway, hopefully I'll be able to get out to Manu before I leave Peru, it would be a great experience to see a jaguar in the wild with my own eyes. Pretty crazy story. But that's all that is. You don't seriously believe that Paradoxian. I must say, that 275-350 lbs is close to world record for jaguar. Average Pantanal male weighs 220 lbs, and all other jaguars are smaller. i really hate jaguars but now i sorta like em! Last year (2009) the local Southern Californian press had a story and photo taken of a jaguar by a motion detection camera placed on "drug routes and illegal immigrant trails". I believe it mentioned that they were several photos taken over a period of time. The location was near the Arizona/California/Mexico border in a mountainous area. The Jaguar is the most powerful cat on earth pound for pound and it's jaw strength is second among all mammals only to the Hyena. The Wolverine is the most powerful mammal on earth pound for pound. If it was as big as a bear it would be the strongest mammal on earth. JAguars are the best felin there is . Tigers are the king,scared of nothing,jaguars i would rate at number 2, you cant give away 250lbs in a fight and expect to win. I really like this site, it's got lots of great information, but I think it should be updated. It seems like its five years old. The last paragraph especially is really out-of-date. Jaguars are amazing cats. But lions and tigers simply will eliminate smaller competitors it has to compete with in its environment. That includes jaguars. Jaguars are strong, but they aren't the strongest big cats pound for pound.